Raging Waters offers great food and snacks throughout the park. Whether it's a delicious all beef hamburger to satisfy your appetite or a creamy serving of ice cream to cool you down, you'll find what you're looking for all here inside the park. 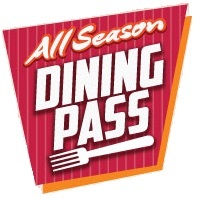 DINING PASS DOES NOT INCLUDE ADMISSION TO PARK. Drinks not included. Meal Options and food locations subject to change. Main Plaza – Serving the timeless restaurant classics of hamburgers, chicken tenders, American fries, cheese fries and soda. Don't forget to try Johnny Rockets original Chocolate, Vanilla & Strawberry shakes. Where the good times roll! Need a Mini Donut fix? Longing for that State Fair taste, but don't know where to purchase these delicious treats? Well, State Fair® Mini Donuts will be offered this season! Come and get you Hot Dog fix on. Serving Hebrew National All Beef Hot Dogs with all the condiments & toppings. Located between Wacky Water Works and Sidewinder. Get one flavor or mix them all. ICEE’s are one of our most popular ways to cool off. Refill your souvenir cup with your favorite flavor all summer long for just $1.99. 2 locations conveniently located near Funnel Cake Factory at the Wave Pool & in the Main Plaza at Oasis Beach Supplies Retail Shop. Pick up a quick snack and go! Located in Main Plaza. Our signature Nachos Supreme, Chili Cheese dogs and BBQ Chicken Sandwiches! Located in Main Plaza. Try one of our favorite treats - a Funnel Cake Factory Funnel Cake with your favorite topping. Located by the Wave Pool. For a quick lunch or snack check out our Grab and Go fridge inside the Oasis Beach Supplies Retail shop. Salads, fruit, sandwiches and more! Looking for something sour? This is the place to fill your sweet tooth with our wide variety of candy. Breyer’s Seaside Ice Cream and Lavazza Coffee! Home of our Dole soft serve and Float! Some of the best of kid-friendly restaurants in San Jose are located inside the park right here at Raging Waters! We offer a wide variety of food options perfect for every diet and appetite. Meal Deals are currently offered at the park and include French Fries and a choice of either a Cheeseburger, Veggie Burger, or Chicken Tenders. Buy a Souvenir Cup and receive $0.99 Pepsi refills and $1.99 ICEE refills all summer long when you bring your cup. 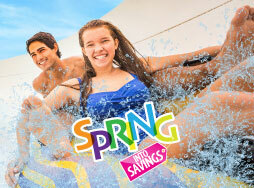 Plan your Raging Waters San Jose trip today! Enjoy a day of water rides, great food, and most of all, FUN. Be sure to view our upcoming events for extended fun. Tickets and season passes are available to purchase online and at the gate.